Our One-Year MBA Program in Strategic Innovation delivers a curriculum and environment to develop the critical thinking and analytical skills companies need. Integral to the program is a business incubator environment that fosters knowledge acquisition, retention, and practical learning. The program uses a live business case to analyze problems, and delivers hands-on learning opportunities with real clients to deliver creative solutions. Our One-Year MBA Program in Strategic Innovation delivers a curriculum and environment to develop the critical thinking and analytical skills companies need. Integral to the program is a business incubator environment that fosters knowledge acquisition, retention, and practical learning. The program uses a live business case to analyze problems, and delivers hands-on learning opportunities with real clients to deliver creative solutions. URI offers many components of its application online and encourages applicants to submit materials online whenever possible. Students may provide all of the following materials via the Internet: a current resume, a personal statement of purpose, and letters of recommendation (applicants e-mail referees, who then send their recommendations directly ...URI offers many components of its application online and encourages applicants to submit materials online whenever possible. Students may provide all of the following materials via the Internet: a current resume, a personal statement of purpose, and letters of recommendation (applicants e-mail referees, who then send their recommendations directly to the school). Students must also provide the admissions office with official transcripts for all postsecondary academic work and an official score report for the GMAT (scores must be no more than five years old). International applicants must provide all the above plus an official TOEFL or IELTS score report (scores must be no more than two years old); the minimum required score for admission is 575 on the paper-based TOEFL, 91 on the Internet-based TOEFL, or 65 on the IELTS. The school notes that most successful applicants have an undergraduate GPA of at least 3.0 and GMAT scores ranked in at least the 50th percentile, but allows that grades and test scores are not the sole criteria for admission. The school seeks candidates with demonstrated strength in quantitative skills, work experience ("valued," but not required, according to university materials), leadership potential, motivation, and communication skills. The One Year MBA at URI integrates course work, career planning and development, and work experience within a one calendar year period, at our main campus in Kingston, RI. The program starts in August and continues over the Fall and Spring semesters. During the Summer, you will be taking two evening courses as well as participating in a 6-credit internship or taking two electives instead. There is a total of 15 courses, or 45 credits, in this program. Only 25 students are accepted each year. The Evening MBA Program prepares you for careers as effective leaders and managers. The program is designed to emphasize conceptual, analytical, technical, and interpersonal skills. Material for this non-thesis program is presented through lectures, discussions, case studies, and both individual and group projects. The MBA program does not require previous instruction in business administration. The program consists of 15 courses (36 to 45 credits, depending upon your undergraduate major). Included in the 45 credits are 9 credit hours of electives that enable you to specialize in a particular area of study. The classes are held at the URI Feinstein Providence campus, 80 Washington Street, downtown Providence, RI. The 4+1 IME/MBA allows students currently enrolled in the IME program at URI to apply early to the One Year MBA program, and waive some entry level courses because of equivalent undergraduate courses. MBA/PharmD - allows students currently enrolled in the PharmD program at URI to apply early to the One Year MBA program, or Evening MBA program and take classes after reaching 120 credits in their PharmD program. We are allowed to use the PharmD classes as electives in the MBA program. MBA/Master of Oceanography - the new one of a kind program allows a student to combine the two degrees in just 16 months! 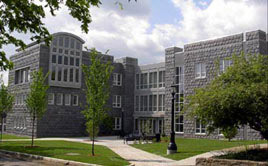 Want more info about University of Rhode Island College of Business Administration Full Time MBA? Get free advice from education experts and Noodle community members.